Raising a child with special needs is a lifelong commitment that is as unique as each person who embarks on it. Written by a variety of authors who share in this distinctive relationship, Chicken Soup for the Soul Children with Special Needs offers a glimpse into the lives of others who are on a similar path. These stories provide insight, comfort, and connection with others who have walked this powerful and transformational journey. The authors of these candid stories relate their own experiences of adjusting, reaching out, and flourishing and share their universal worries, their tears, and the laughter that come with this extraordinary relationship. 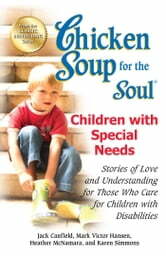 Most important, through these stories, you will be guided with the wisdom of fellow parents, caregivers, and those with special needs to help you be the very best parent or caregiver you can be.